At the time of the interview, Natalie was wowing audiences in Rock of Ages at the Shaftesbury Theatre, where she has performed as Sherrie since the musical opened in August, 2011. Natalie’s early career saw her on tour in the UK with several productions including Footloose, Fame and Evita, where she not only laid the foundation for a successful career, but also “made friends for life”. She made her west End debut in Mamma Mia at The Prince of Wales Theatre, understudying (and playing) Sophie and Lisa, where she had a fantastic year, before joining the cast of Rock of Ages. Earlier this week Natalie answered some questions about herself and her career. Enjoy! At what age was your talent for singing discovered? I actually wasn’t very confident when I was younger and I hated being the centre of attention. To boost my confidence, my mum enrolled me in singing lessons when I was 7, and the teacher told my mum that within 3 months I’d be up on stage singing. The rest is history. Once that happened, you couldn’t shut me up! Was there anyone in particular that inspired you towards a career in performing arts? I’ve loved performing since I can remember but in all honesty, a career in theatre wasn’t something I considered till my A Level years! I always had films like ‘Show Boat’, ‘By the Light Of the Silvery Moon’, ‘Oklahoma’ and ‘Calamity Jane’ on repeat as a child, so I suppose Gordon MacRae, Howard Keel and Doris Day were always an inspiration! But it never even occurred to me that you could do what you love as a career. There aren’t any other performing artists in my family, so it did take me a while for me to figure out that musical theatre was the career choice for me. Can you remember one of your earliest performances in front of an audience? It was one of the first shows I ever did with my local theatre school, and is captured on VHS forever. We were little belly dancers! Something my friends and I love to reminisce about and laugh over from time to time with a glass of wine. You trained at the London Studio Centre. What are some of your favourite memories from there? 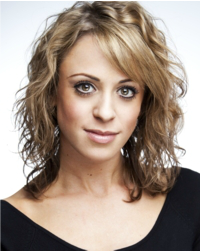 You have toured the UK with several productions including Footloose, Fame and Evita. What was it like being on tour with these fabulous musicals? Touring makes it incredibly hard being away from friends and family back at home, but you create a new family. You work, live and socialise with the same people for a long time, so you do get very close. I’ve made friends for life through these jobs and being so passionate about what you do for a living helps! I’ve been so lucky to work with talented casts, directors and choreographers on such well known productions. It’s really lovely travelling the country and seeing new places too. You were in the cast of Mamma Mia! The Musical at the Prince of Wales Theatre. What was it like performing in this fun musical? It was my first West End show, so a very special moment. The show really focuses on vocals which was an aspect of the job I really enjoyed. Understudying Sophie and Lisa kept me very busy, it was a fantastic year. Oh I can’t ever listen to another Abba song ever again now. It makes my head hurt! You are currently in the cast of Rock of Ages and since opening have performed as Sherrie, one of the lead roles. What has this experience been like? AMAZING. As I went on for Sherrie so early on in previews, I unfortunately didn’t have the opportunity to go through the usual rehearsal process that an understudy usually would. But the cast and company were incredibly supportive, and made the first show so easy! I really am very lucky and it has been an unexpected but welcomed opportunity. I’m loving every minute of it! How would you describe the character of Sherrie? She’s confident, driven and ambitious, yet has a vulnerable, naive side…. I think I just described myself! Why do you think it takes Sherrie and Drew so long to realise how they feel for each other? They’re never actually honest with each other from the start! They have their own paths to follow, and with so many interruptions and crossed wires within their relationship, I’m not surprised it takes them an entire 2 hours! What is it like backstage at Rock of Ages? I’m having the most fun on this job, like no other show I’ve ever worked on before. The company are genuinely wonderful people, I honestly laugh till it hurts every day. Other than that, incredible noisy! Which is your favourite song in Rock of Ages? Most definitely ‘More Than Words/Heaven’. It’s a beautiful moment in the show that still takes my breath away every day. I get completely lost in the moment, I love it. Why should everyone go and see this popular rock musical? Because it’s the most fun you’ll have on a night out EVER! You performed on Children in Need with the cast. How did it feel to be part of this national fund-raising event? Being part of a team that helped to raise such a substantial amount of money for such a worthy cause was a fantastic experience, one I’ll never forget. Having said that, it was pretty nerve-wracking. But what a buzz! Apart from any of the cast of ROA, who would you most like to sing a duet with? Gary Barlow, George Michael and Chris Martin….. I LOVE THEM ALL. Do you have any career ambitions that you haven’t yet fulfilled? I’ve always said the one thing I wanted to do in my career was to play a part on a West End Stage. And I’m doing it. This really is a dream come true. Absolutely nothing! Glass of wine, a roast dinner and a Sunday movie and I’m one happy girl. What message do you have for your fans and supporters? Thank you so much for your support, you lovely lot! YOU ROCK. Many thanks Natalie for a great interview!